In the current frenzy of opinion polls, its interesting see them in the context of the previous 5 years of polling. Today we saw a constituency specific opinion poll for Dublin West. The Millward Browne survey, published in the Irish Independent, polled 520 voters and was carried out between February 5 and 8. We’ve analysed the last 5 General Elections in Dublin West to see if there is any truth behind the claim that the Tánaiste might struggle in the forthcoming election. Does today’s poll sound right? The poll publish today has Joan Burton on 10% which is slightly more than how the Labour party is doing nationally (8% in the last poll). This is consistent with 4 of the last 5 elections where Joan has outperformed her party by a similar margin. She did even better in 2007 when she substantially outperformed her party by 17% to 10%. Can we compare the current election with any in the past? 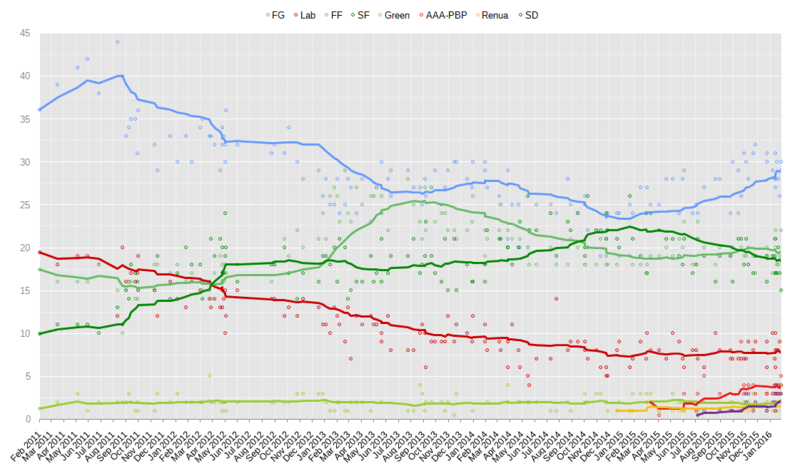 All elections are different, but if we look back to 1997 the Labour party had just been in coalition with Fianna Fail, and saw its national vote drop from 19% down to 10%. Joan saw her vote drop from 22% to 12%, and more importantly she didn’t get elected in 1997 (the only time in the last 5 GEs). Has she pulled off a spectacular recovery in the past? What does she need this time to get elected? Being the Tánaiste and a Minister would certainly help most candidate’s profile. But if her first preference votes don’t hold up, she’ll need a lot of transfers. She may get some favourable numbers from the two FG candidates, but its hard to see if other parties or independents will transfer as much as they have in the past. Our analysis suggests that at 10% share of first pref votes, she will struggle. It looks like she’ll be in a fight with Ruth Coppinger for the last seat and if she is behind the AAA-PBP candidate at the start, then the Tánaiste may not make it. The Electoral (Amendment) (Dáil Constituencies) Act 2013 (No. 7/2013) is a law of Ireland which provides for parliamentary constituencies to take effect at the next Irish general election for the 32nd Dáil Éireann. This election is due to take place in 2016. This Act replaced the Electoral (Amendment) Act 2009, which defined the constituencies used for the 31st Dáil (elected in 2011). The 2012 report of the Constituency Commission, an independent body established by the Government of Ireland to review constituency boundaries, proposed several changes to Dáil constituencies. These changes were provided for by the Act. It also reduced the number of seats in the Dáil by 8 from 166 to 158. This table below, summarises the changes in representation. It does not address revisions to the boundaries of constituencies. No. : The number of the constituency (in alphabetical order). Constituency: The name of the constituency. Compass points follow the area name in this list, which is not always the case in the official version of the name. Created: The year of the election when a constituency of the same name was last created. Seats: The number of TDs elected from the constituency under the Act. Change: Change in the number of seats since the last distribution of seats (which took effect in 2011). The next Irish general election must take place no later than 8 April 2016. The election will be called following the dissolution of the 31st Dáil by the President, at the request of the Taoiseach. The electorate will elect the members of the 32nd Dáil who will assemble shortly afterwards to elect a Taoiseach following agreement on the Government of the 32nd Dáil. The current statutory framework for the setting of a date for polling day in the general election is set out in the Electoral Act 1992 (as amended). Section 33 of that Act requires that the Dáil be dissolved within five years after its first meeting following the previous election, which was on 9 March 2011. Section 96 requires that the poll is held, not earlier than the seventeenth day or later than the twenty-fifth day, following the day on which the writs for the election are issued; this count does not include “excluded” days, such as Sundays, Bank Holidays, or Good Friday. The writs for the election are issued by the Clerk of the Dáil on the day the Dáil is dissolved. With these restrictions, the Dáil must be dissolved no later than Tuesday 9 March 2016, and the next general election must take place no later than Friday 8 April 2016. Taoiseach Enda Kenny suggested at a press conference in September 2013 that the next election would be in March 2016. This was in the context of speculation that the Labour Party was unhappy with the coalition government’s progress and might consider withdrawing and forcing an early election. The days around Easter Sunday on 27 March 2016 will be the culmination of the official commemoration of the centenary of the 1916 Easter Rising, and there has been speculation that the election would be earlier to avoid clashing with these. Another factor is that Saint Patrick’s Day, 17 March, traditionally sees most ministers make official trips abroad. In June 2015, amid speculation that the election would be in the autumn, Kenny said it would be when the government’s programme was completed. Ireland uses proportional representation with a single transferable vote (PR–STV). The general election will take place throughout the state to elect 158 members of Dáil Éireann, a reduction of 8 from the current 166 members. This follows the passing of the Electoral (Amendment) (Dáil Constituencies) Act 2013. The Ceann Comhairle is automatically re-elected unless he opts to retire from the Dáil. The election will take place in 40 parliamentary constituencies. Each multi-member constituency returns no fewer than three, and no more than five Teachtaí Dála (Dáil deputies). All of Ireland’s Presidential Election results are now up IrelandElection.com. We have the main result for each election, as well as a breakdown of each count and every constituency in Ireland. Out of a possible 13 presidential elections, 6 were not contested while 7 were to a public vote. Its only recently that there has been a big increase in the amount of candidates, with the election in 1997 having 5 candidates and 7 candidates in 2011. European Elections – All Counts – All Constituencies – All Elections! We’ve just added a European Parliament section to our website. This lists all of Ireland’s European Elections, and for the first time every count in every constituency is available for all 8 elections, stretching back to the first one in 1979. Did you know our first MEPs weren’t elected. Between joining the European Parliament in 1973 and the first election in 1979, 10 MEPs were appointed directly by Oireachtas in 1973 and again after the 1977 general election. From then on, its all been elections. As with all our data, these Euro Election results come with all our usual goodies, including, Party Share, Change from previous election, Transfer Analysis (including our Sankey Chart), Race through the counts and much more. With two upcoming referendums, we thought it might be worthwhile looking back at how we voted in previous ones. We have just finished putting up on our website, the constituency data for all of Ireland’s past referendums. You can access it from our homepage or by clicking here. November 1982: What were you doing? Well, if you were over 18 you might have been out voting. And for the first time you can view all the counts from the November 1982 election right here, on IrelandElection.com. This is the first time they’ve been fully available online. This was the last of 3 general elections to be held within a year and a half. And it was a record one for Fine Gael, giving them their best result in a general election (only to be bettered by their 2011 performance). Women TD’s also increased their share from 8 seats to 14. More general elections to come. 1987 General Election counts: We’re first to bring you this data online, again! All the counts for the 1987 Irish General Election are now on our site and available online for the first time. The result saw Charles Haughey lead a minority government and also saw the first appearance of the PDs. For those interested in such things, there were three constituencies where surpluses were distributed in the order they occurred and not by largest surplus first (which is often the case). Were surplus-distribution rules different in 1987? My understanding of how the counts work, is that when there is more than one surplus to be distributed, the larger surplus is distributed first (as it can have the most effect for candidates at the bottom). We’re currently compiling data for the 1987 General Election counts and we’ve come across two constituencies so far (Louth and Dublin South Central) that didn’t do this. They distributed the surpluses in order of being elected, which in these cases meant the smaller surplus was distributed first. So my question is, were surplus distribution rules different in 1987? Hope this makes sense, and any advice on the matter would be appreciated.